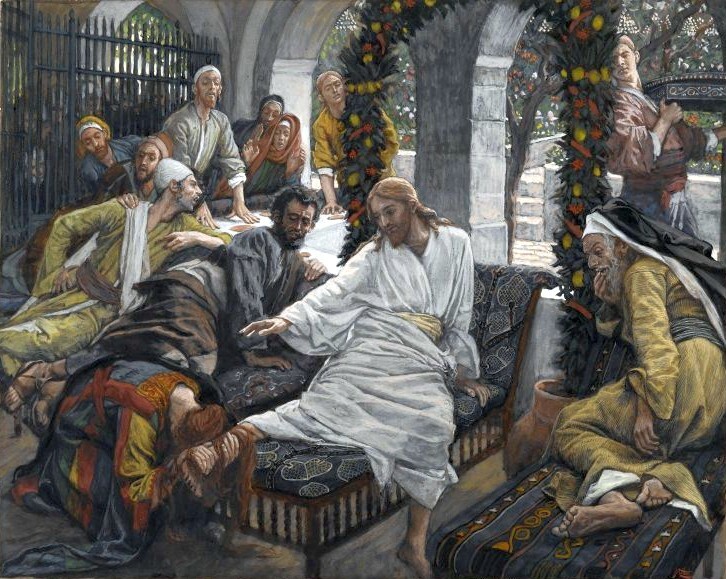 When I saw that the Gospel for the 5th Sunday of Lent in the lectionary’s “Year C” was “the anointing at Bethany,” I expected the text to be Luke 7:36-50. Year C is anchored by the Gospel of Luke. But there it was in the list: John 12:1-8. I’m not privy to what the committee had in mind when they made their selection of texts but I’m always curious. So I started poking around in the versions of the story in the different Gospels seeing if I could make an educated guess. It is a very curious subject. Partly it’s interesting because it is a very important story: In both Matthew and Mark Jesus makes a point of saying that the story of the woman anointing him will be told everywhere the Gospel is preached — which seems to be fulfilled, in a way, by the fact that each of the four Gospels tells some version of it. But what the four stories have in common is kind of minimal. The person who anoints him is a woman. In whose house was he anointed? Matthew and Mark say the home of Simon the leper. Luke says the home of a Pharisee. John says the home of his dear friends Mary, Martha, and Lazarus. Matthew and Mark don’t say. John says it was his dear friend Mary. How exactly was he anointed? Matthew and Mark say it was his head. Luke and John say it was his feet. Matthew, Mark, and John say she was anointing Jesus in advance for burial. Luke says the great love she showed in anointing him is connected to the fact that she was forgiven of a great sin. Most interestingly, when was she anointed? In Matthew and Mark it happens in the middle of Holy Week — several chapters after Palm Sunday, but before Maundy Thursday. In John it is just before Palm Sunday. But in Luke it is actually twelve chapters before Palm Sunday — he won’t even start predicting the passion for two more chapters. Maybe he went to the house of Simon the Pharisee, a victim of leprosy and the otherwise unknown brother of Lazarus, Martha, and Mary. Then at some point his good friend Mary (who had always been the black sheep of the family — she’d done some terrible things) broke open a jar of ointment which she’d bought and poured it over Jesus’ head and his feet. She intended to show love, but he interpreted it as anointing for burial. Or he had already ridden into Jerusalem on Palm Sunday and went on to the Upper Room for Maundy Thursday. Or maybe he was anointed on three separate occasions? But the differences don’t bother me. They are part of the literary artistry of the Evangelists, taking a known and important story about Jesus being anointed by a woman in Bethany, and weaving it into their own Gospel narrative. They may place it where they heard it happened, or where it made a theological and literary point. Anyway, I’m guessing the lectionary committee decided it was more Lenten to use John’s version that took place on the cusp of Palm Sunday rather than Luke’s which came so long before. They do get Luke’s version into the calendar on occasion: it is used on Proper 6(11) which gets read only if Easter happens pretty early in the year. For whatever reason, though, what we have right now in Lent of Year C of the Revised Common Lectionary is John’s version. Jesus is at the home of the one family whom the Gospels connect him with as genuine friends. Sure, the twelve were his Apostles, and three among them were his most intimate companions, and one of those three was the one whom Jesus loved. But he seems to sort of hang with Mary, Martha and Lazarus. Aside from this scene, in Luke 10 he goes there with the Apostles for dinner — you know, the one where Martha served and got grumpy about it, while Mary sat with the other disciples at Jesus’ feet. And in John 11, when Lazarus had died, Jesus stopped by to comfort Lazarus’ sisters and then obligingly raised him from the dead. There is real affection there. John 12:1-8 comes only a few verses later. When Mary anoints Jesus it comes across as a gesture of loving gratitude to the point of awe, maybe even worship, for bringing her brother back to life. And one should note that this is a very different motive than Luke attributes for the anointing. In John, just as in Luke, Mary loves much. But in John there is no hint of penitence or of sin forgiven. The other distinctive feature in John’s account is the treatment of Judas. In Matthew and Mark there is a general conversation complaining that the expensive ointment should have been sold and the money given to the poor. Only in John, Judas alone voices this complaint. John takes a quick swipe at his fellow disciple, telling us that Judas had been trusted with the whole group’s money, and he used to steal it. Both the stealing and the tattling are kind of unseemly. But we Christians do bicker against each other, so it adds a bit of realism. It’s catchy, and it’s true, and it is so easy to make it an excuse. There have always been poor people. There always will be. And we really do need to be helpful, loving, generous, whether we are giving alms individually or solving the structural problems of society. Jesus’ point was not that you should never care for the poor. His point was that generous gifts of love are a beautiful thing. This is the reasoning that has stood behind centuries of art and architecture given sacrificially to make beautiful houses of worship. Of course those dollars could have been given to the poor. But when given to Jesus, Jesus receives them — or the church receives them in his name. Mary was extravagant in her love for Jesus. She made a big bold statement pouring out that perfume. Jesus knew he shouldn’t refuse Mary’s gift. Sure, it seemed impractical. And receiving it was probably extremely awkward. You are visiting friends for a summer barbecue. Everyone is sitting in the back yard with their shoes off. Your hostess kneels down in front of you, opens up a bottle of Chanel no. 5, and pours it all over your feet. Then she picks your feet up and wipes them off with her long hair. You might not go over to their house any more. I’m just sayin’. But Jesus receives it. He accepts the awkward love of a friend. And he puts the best possible spin on it. On the one hand, the perfume was hers to do with what she wanted. And on the other hand, with the big picture in mind, Jesus said she was anointing him for burial. Of course mentioning that at your neighbors’ barbecue would probably be pretty awkward too. I’d love to send you my Monday Meditations, along with my other new articles and announcements. Scroll down to the black box with the orange button to subscribe and they’ll come straight to your inbox. I’m always struck by the vulnerability of Mary in this story. As I was reading this passage, I kept going back to the “Song of Songs.” Some of it resonates nicely with Mary, including later on when she mournfully seeks Jesus at the tomb. I’m curious — what did mystical writers say about Mary, who seems like such a natural contemplative? I’m not sure what mystics wrote about this scene. I do know that the other scene at the same house where Mary sat at Jesus’ feet and Martha served the meal is the classic text to discuss the legitimacy of both the active life (Martha) and the contemplative life (Mary).